Most enterprises seeking to go Cloud Native these days cite velocity as their primary motive. Indeed, being able to move quickly and get to market fast — getting a new idea into production within days or even hours, instead of months — is a powerful strategic advantage. But Cloud Native, when done right, confers another, less recognized benefit that is even more powerful: it transforms traditional technical risk into competitive advantage. Think about it. It used to be that “low risk” meant “don’t experiment.” The customary model was for organisations to be massively risk averse, to minimise uncertainty at all costs. This dovetails perfectly with the monolithic mindset of avoiding danger by always moving slowly and carefully. Ultimately, wholesale risk aversion becomes thoroughly integrated into an organisation’s identity. Change becomes more and more difficult to achieve. In this culture, new deployments represent risk – potentially breaking the existing system’s complex and wholly interdependent services. They are treated not as opportunities but as sources of anxiety. Cloud Native philosophy completely upends this thinking. It is all about moving quickly, by taking small, reversible and low-risk steps — and doing this constantly. Multiple times per day, even! A true CN enterprise needs to be ready to constantly iterate and experiment, step back, try again and try differently. This applies to every area: new ideas, new processes, new products. The goal is to shift from a culture of laboriously seeking a single long term “right” solution to an open approach, exploring and testing many possible answers. Dropping the ones that don’t work, quickly and with no harm done, and quickly implementing the ones that do. Moving fast, only without breaking things. High risk is the new low risk! Experimental culture is the new low risk, but it obviously can’t simply be bolted on top of existing company culture. The organisation undergoing CN transformation needs to shift its collective culture and mindset from “safe and slow” to experimental and iterative — just like it is shifting its technologies and infrastructure from legacy to cloud-based. Provisioning infrastructure used to mean buying machines for in-house physical data centres. That entailed the risk of buying the wrong solution, or too much of it, or not enough. No matter your decision, you were locked into it. Cloud machines, however, you buy on spec; if they’re not right, you give them right back. You only pay for what you use. The same with tools and services: you can just shop around and try them out, rather than taking two years to build them yourself (only to find it wasn’t what was needed in the first place). Cloud Native quite simply de-risks many traditional tech sector troubles. Fundamentally, then, Cloud Native is not about speed, scale or margin (though these are all terrific side benefits!). CN is about building an organisation that can transform and adapt far faster by removing the technical risks associated with change. This is revolutionary, especially for online enterprises: companies can potentially vary their products in a CN pipeline with the same speed they’re able to update website content using their content management system. 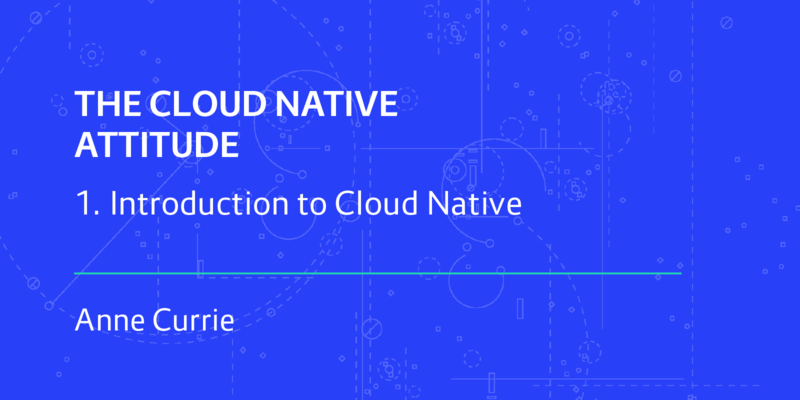 At its best, a Cloud Native approach is as much about de-risking as it is about accelerating change, allowing companies to become more responsive. It’s extremely powerful, yes — but unfortunately “low risk” does not mean “low effort.” Getting there requires an organization to truly transform itself, not just technologically but also culturally. The process isn’t free, and it isn’t easy. But the risk of doing it has never been lower.